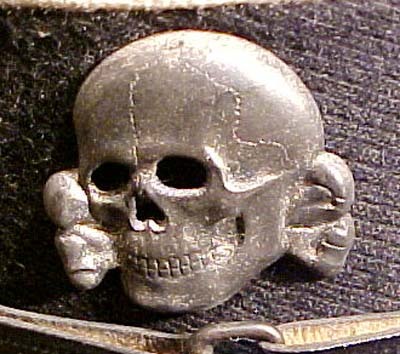 Recently while enjoying browsing around a flea market, fascinated to see the detritus of people’s lives on display, came across an item that sent shivers down the spine; there amidst the discarded teddy bears, Elton John CDs and cracked mirrors was a military cap of the Nazi SS, complete with notorious death-skull cap badge. Seeing it there, with the sound of children enjoying the Summer, produced an immediate reaction of revulsion. That anyone could profit by trading an item with such horrific and genocidal associations was extremely troubling. What added to the sense of concern was when a young guy came along and stopped to inspect the hat, which he did so with great care, clearly pondering if it was genuine or a replica worthy of investing. It was hard to believe anyone could consider buying it, what would they use it for? Wear it to parties or preen themselves in the mirror, admiring the image before them? Such questions flashed for an instant. Then for what seemed an eternity he motioned to place it upon his head, what massacres had the SS sadist who owned that item been present at? The screams, torture, agonizing deaths and destruction, forever associated with that hated bunch of psychopaths, symbolized by that item and under a blue sky this guy was about to happily check it for size! Thankfully he paused and returned it to the table and moved on, but the event left a disturbing scar upon the rest of the morning, walking around the stalls, contemplating the parallels between the atrocities and aggression waged by Nazi Germany and China’s invasion and subsequent treatment of Tibetans. Though no analogy is ever perfect there are indeed some very disturbing similarities, including of course a state engineered program of forced sterilizations, although China has far eclipsed, in terms of scale, the brutal sterilizations enforced by the Nazis. Tempting though it was to reasonably conclude that such ‘military memorabilia’ should not be for sale, at the same time seeing it lying there surrounded by discarded household items and thankfully ignored by everyone, apart from one interested party, presented a revealing lesson in itself. In that life triumphs overs the darkest tyranny, no matter the horrors, Within that context that emblem of cruelty and violence was powerless, a vacuous shell, just another piece of junk, animated only by an understandable emotional response, the flea market was a suitable home to that cap. It served as a reminder of the transitory nature of such regimes, that despite their displays of power and violence, are destined to fall. With that in mind, who knows, at some future point perhaps a Tibetan may attend such an event and notice for sale some memorabilia from China’s Public Security Bureau, an organization with chilling reminders of Nazi Germany’s Gestapo and inflicting untold suffering upon the people of occupied Tibet. Like Himmler’s failed thugs, one day it too will have been consigned to the garbage dump of history. Very interesting point, enjoyed reading it.